I turned on the heat in my car the other morning as I drove to campus, and I have worn jackets. But this leaf was on the apartment complex sidewalk while neighbors still sweltered poolside, I took the photo because the leaf is lovely, peach-tinted instead of aflame. But I didn’t notice the piece of dead grass lying atop it, and I didn’t want to pick it up and press it flat between book-pages because I didn’t want its loveliness. I never want fall. It comes anyway. My days are bookended by thirty minutes in the car, which is new. I listen to music, setting my digitized music collection to shuffle, and while I drive, every musical whim I’ve had confronts me. Sometimes the randomization creates patterns—three and four songs by the same artist in a single drive, out of hundreds of artists and two thousand single tracks—and I sink into when and where and everything is fleeting. The player is set to fade tracks in and out, so the beginning of one song overlaps with the end of the previous, partly for the unexpected juxtapositions, but mostly to avoid flat air. There isn’t much music I’ve ever grown out of. Some things fade out of intentional listening patterns, but when the music I loved best at ten and fourteen and twenty-four cues up, I usually let it play. When there are too many things to think, often on Monday mornings and Wednesday evenings, I turn the music louder and louder and it isn’t until I park that it seems far too loud. I drive with the windows open. I remember that I actually like the smell of skunk, and I remember how close the scents of manure and earth and drying cornstalks. With the windows open, sometimes bits of leaf and chaff blow in, sometimes rain. 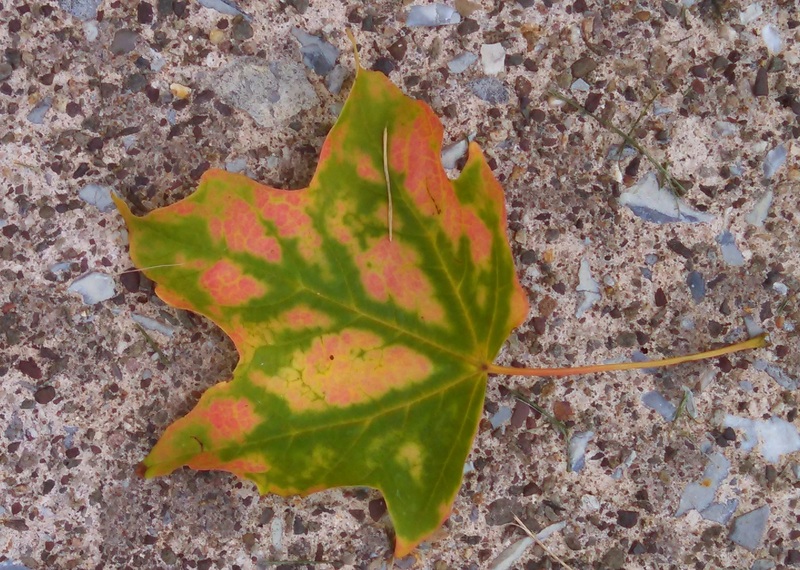 Sometimes the air here smells like melting chocolate and roasted almonds, but I still only want to eat peaches, all summer-tasting and sunrise-hued, the colors of this heatmapped leaf. There’s no sense in me saying not yet. Waiting until I’m ready only means dead time between tracks.